Today's posting is a non-bento posting. After lunch time, I was cooking this steamed pork with sweet mui choy (sweet preserved Chinese cabbage) for tonight's dinner and just took a picture after the dish was cooked. And the following are the simple steps to prepare it. (1) Marinate the pork with sesame oil, pepper, salt, sugar, and sweet soy sauce. (2) In large wok, heat 1 tbsp cooking oil and saute garlic and shallots until fragrant. (3) Put the marinated pork inside the same wok, add 1 cup of water and stir until well mixed about 15 minutes. (4) Arrange the sliced pork inside a steaming bowl, add sweet mui choy on the top and add some liquid into a steaming bowl. (5) Steam it in high heat for about 1 hour. (6) Serve it hot with rice. 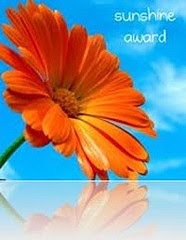 Another award from my blogger friend, Marisa (All in Good Food). She is a great bento friend with her passion in cooking and bento making. I felt honored to receive this award from her. This is one of my family favourite dish. Our steps almost the same to cook this dish..haha.. Recently i had try to braise on the last step instead of steam, it turns out great too. The recipe sounds delicious as well. Makes me want to rush over to your place and join you for dinner (as I will probably never have the opportunity to taste this anywhere else :o)). Lia, the dish looks amazing! Thank you for sharing all your wonderful recipes, and your bentos certainly bring smiles (and sunshine) to my day. Congrats on the award, and thank you ver much for passing it on to me!! Have a wonderful day. Thank you Lia for passing this award to me. I'm so excited because one of my new blogger friend Biren of Roti n Rice also gave me the same award. Oh I forgot to say I love your mui choy with pork. Very nice presentation. Hi Lia, I am not familiar with mui choy and now that you've introduced me to this tantalizing recipe I'm going to hunt down this ingredient! Sounds and looks delicious. I'm amazed more each day with your superb cooking and photo skills. Congratulations on recieving an award too! Don't know about this dish, thanks for sharing it Lia! Looks so pretty in your lovely dishware! Hope you enjoyed your Friday! I imagine your house always has some wonderful smell coming out of it! Your pictures always look so professional! @Fluteloop : Thanks a lot for your sweet comment! 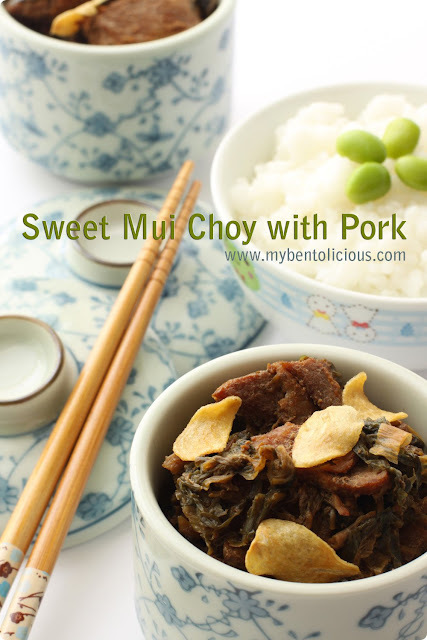 It's the first time to learn about mui choy and so appealing! I love kinds of Chinese pickles and a combo of them and pork. Sounds really yummy, I can see that. This is a very popular Hakka dish. I love eating it although many people don't anymore because of the fatty content from the meat. @Xiao Yen Recipes : Yes, you are right! My family is Hakka so this dish is one of our favorite. Usually we use pork belly which is more fatty but I change it to tenderloin hoping to reduce the fatty :) Thanks!